The Scoop Entertainment: First Gay Pride weekend of june: mexico city & warsaw!!!!! 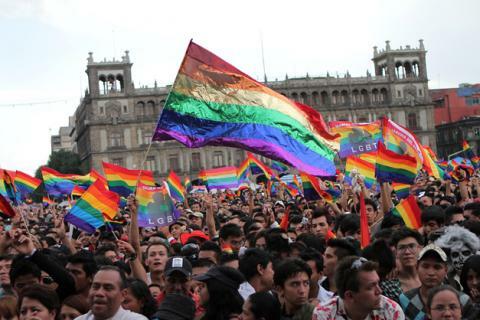 First Gay Pride weekend of june: mexico city & warsaw!!!!! Check out this amazing story about the first pride weekend of june 2012. Mexico city kicked off the weekend with parade on Saturday like no other featuring superhero groups, gorgeous flamboyant male dancers, and even a few eggs being tossed. Of course this was from no one but the haters and they were quickly arrested but this did not stop the parade from continuing. The lgbt community came together and ran the streets of mexico city like no other has done before them. Many signs were made and even children were a part of this parade. And later that weekend, in warsaw the next parade kicked off with rainstorms but that did not stop our community from spreadin’ the love!! The most outstanding outfit worn there was a man wearing none other than just his spandex and attached all over the back of his body was a beautiful rainbow rendition of balloons. Children were excited there too. Our community pride for this month is quickly kicking off and taking affect. Next place is capital pride in Washington!! !